On the day of the Commonwealth Games Opening Ceremony, chief minister Sheila Dikshit gave a TV interview in which she managed to appear at once smug and humble. She tut-tutted gently about the mess in the run-up to the Games, when preparations were not directly in her hands, and, because she was far wilier than the interviewer, was allowed to dwell upon what she described as her government’s success at cleaning things up at the last minute. Then she neatly turned the tables on the interviewer by tut-tutting sorrowfully about how self-indulgent and childish the media had been in focusing only on Games disasters while there was such sterling evidence of success: the Yamuna flood relief measures that had been organised at such short notice and on such a large scale. And so on. Plainly you have to get up early to catch this CM on the wrong foot. I found this interesting for all sorts of reasons. First, clearly it is true. Yes, with guests on their way, I would like my home to do me credit. Second, it is brazen. It amounts to saying that beggars and urban blight amount to the same thing and are unlovely and for that reason it is OK to hide them away when someone calls. Third, these clearly aren’t your neighbourhood friends visiting. You are not on equal terms with these guests; you hope they will go away impressed. So it isn’t a new Delhi that’s come out of all this. (I’m not counting the Metro and airport, because they are not just for the Games.) It’s just a neater version of the old Delhi. And, in the nature of Indian things, it is extremely unlikely to last. This seems like a great loss, because how often does our government show itself willing and energetic enough to revamp a whole megacity? Could we not have done something a little more interesting than apply spit and polish? Delhiites are not noted for their civic behaviour, so no meaningful change would have been easy to accomplish. But this was a good opportunity to try. Here are a few things I can think of that we might have tried. Restrain your disbelief as you look through them. Eventually they will have to be done, or else our city will become unlivable, unviable. 1. Greenbelts. We could have revived the Ridge by freezing any further encroachment and turfing out the greedy armed forces. We could have planted belts of sturdy trees around the city, especially toward the west and southwest, to help keep out the desert sand and dust. 2. We could have done more to clean up the Yamuna. We didn’t, and yet the Games Village sits on the Yamuna bed, looking out at ugly road bridges and power plants. That’s ingratitude. 3. Only the top few most-visited historical monuments have got the loving treatment. How about the dozens of important ones, and the hundreds of minor but beautiful ones? Instead another huge chunk of Siri has been scraped clean of trees and sports facilities built on top. This is appallingly stupid and short-term behaviour. 4. Urban farming. Instead of buying ill-treated vegetables from the Yamuna bed and nearby districts, at least some urban demand could be met by urban farming. You might not think it, but Delhi does have plenty of spare land in state and private hands. Tell us how, give incentives, make neighbourhood sales and supply possible. 5. Instead of an isolated luxury “village” for delegates which will later belong to affluent Delhi investors, how about something along the lines of DDA projects for middle-class housing? Here was a chance to get DDA to build to high standards and innovate once again for a better balance between private and communal living (private developers have lost the plot on that). 6. Making Delhi more walkable. It’s not just pavements that are needed. That too, but also something to give them life. A mix of streetside activities, places to sit. Most important, perhaps, covered walks to keep the sun off walkers — ancient Roman and even some Indian cities did this with long, shady, useful arcades along streets. It could be done in many parts of Delhi. 8. Really doing something about parking. This argument about less parking = less cars on the road = more people in public transport is not in tune with Indian reality. Have better, ample, paid parking. Change the rate regime, for sure, but give people space to put their cars. Eventually we might all use electric cars, but personal transport is here to stay. There are lots more. The irony is that such a programme of renewal, and the colossal publicity it would have gathered, might actually have brought us the tide of tourists the Commonwealth Games have not. And we would have been more confident, possibly happier, and probably better off — immediately as well as in the long term. Last week a design-related experience left me angry and unsettled. We went to pick up a relative at the new international airport terminal. The plane was to land around 3 am, so we were on the Gurgaon highway at about that time. The lane leading to the international airport exit was marked, on the big green signboards above the highway, thus: “I.G.I.A. Terminal 3″. This was our first visit to T3. As we neared the new terminal we had to decide what lane to get in for the premium lot at Arrivals. No clear answer! All sorts of cars had slowed down at the same spot so that the drivers could figure out which lane to enter. We picked the lane that said “ARRIVAL” and “Premium Lane”. No! Wrong choice! A poor securityman had to wave us down and come jogging up to the car to tell us we were not allowed on this lane. But arrivals, premium? No, sir, not allowed, take the the other lane. So we reversed out and took the other lane. We reached the very end of the terminal, and pulled over. Ah, it turned out that the numbering of the pillars has nothing to do with the numbering of the gates. Way behind pillars 13, 14, 15, etc., were Gates 4, 5 and 6. Not plainly visible from the car lane. So we got off and walked toward the terminal. Our driver said he’d try and wait there, or else circle around. The main parking lot looked like a hassle to enter and leave at short notice, what with access control and multiple floors. We had to cross two lanes and two broad strips of pavement before we reached kerbside. No zebra crossings were marked. But there wasn’t much traffic, so that was OK. One intervening lane was a taxi lane. The other was the premium lane to which we had been denied access. There were expensive-looking private cars and luxury rental cars parked there. Why were we not allowed to use the lane? We had been perfectly ready to pay. At the airport facade we decided to enter the Visitor’s Lounge. Where’s the entry gate? It was small and tucked behind a large pillar. The securityman sitting there said we had to walk to the next gate to buy an entry ticket. So we did; a good 50 metres. Next to the ticket booth (with its polite operator) was a gate also leading into the visitor area. We were not allowed in. Go back to the first gate, said this guard. So we did. Inside, the air smelled nice. It was also cold, so we went to use the washrooms. The door creaked and groaned so madly, loudly and slowly that we were hearing it still as we walked out of the washroom. The relative arrived. She was very pleased with the airport interiors, especially with the Paresh Maity paintings inside (she is a Maity fan). Pushing the luggage trolley, I phoned the driver. The poor fellow had been chased away from his distant lane and had then parked and was chatting with some policeman. I spoke to the policeman over the phone and asked him whether we could use the premium lane. Yes, of course. Phew, we thought, no need to push this trolley 100 metres (I measured the distance on Google Earth) to the distant car lane. Our car still wasn’t allowed into the premium lane. So we started the long trek with the trolley. There was no way to get the trolley off the kerb. No slope, just a vertical drop. All around us, individuals and families and old people were doing their best to get the trolleys down without spilling their luggage. I walked a long way looking for a walkable section, but there wasn’t one. So we huffed and puffed and lifted the trolley off the kerb. We had to get the loaded trolley on and off two more pavement sections before we reached the car lane. Ouch. Someone at the airport seemed to have belatedly realised this disaster and one (one!) sloping ramp had just been cut out of the kerb and cemented. There was caution tape around it, because the cement wasn’t yet dry. That last section of the furthest car lane outside the Arrivals gates was busy with many cars and people. It was a very Indian operation (think functional chaos) getting the car close enough to the kerb to enable us to load the luggage without too much trouble. So much for streamlined. Phew. We were done. We headed home. But I was sweating and cursing the thoughtless people who had laid out this part of the airport, and those who were supposed to administer the premium lane. The only airport I know well enough to compare T3 to is Washington DC’s Dulles International. There, too, you exit onto car lanes. But the parking is straight ahead, it’s surface parking, and what’s more, there are zebra crossings and the pavements slope gently so that you can waft your luggage comfortably towards your car or one of the airport-city shuttle vans. Dulles is nothing fancy, but it’s infinitely more convenient. So: go ahead and complain about iffy Commonwealth Games infrastructure, and cheer instead the capable Delhi Metro. But don’t forget to ask why, when the new airport will probably cost Rs 16,500 crore ($3.5 billion, which flyers are now being told to help pay), the contractors didn’t bother to find a designer who could have helped them get the basic inside-outside interface design right and user-friendly. The airport is not fully operational yet; imagine the chaos when all domestic and international air travel through Delhi converges on T3. The mind quails; but the spirit is Indian, so it will adjust. How many of you readers like the new rupee symbol? I don’t (despite a caveat, which we’ll get to). Here’s why. Everyone knows what a Devanagari “r” looks like. It’s an elegant letter, but is that enough? If you think about it, the other major currency symbols come with a lot of history. There are several hypotheses regarding the origin of the $ sign, for instance. Was it from an 18th- and 19th-century abbreviation for the Mexican peso? Does it recall the Spanish “pieces of eight”, the ones that were mined in Peru and shipped across the Atlantic to Europe to pay for Spain’s wars and fuel a worldwide 16th-century price boom? Does it have something to do with the Greek god Hermes? There are more — lots more. The sign for the UK pound sterling, £, originates from “L” for the Roman libra, a unit of weight. The word comes from the Latin for “weighing scale”. So it is well over 2,000 years old. The euro, €, is, and looks like, something delivered by a committee. E for Europe. But also € from the Greek letter epsilon, or Є. So it is even older than the £. And at least it looks interesting in different fonts. The yen sign, ¥, is boring. Fortunately, we hardly ever need to use it in India. You can make the $ with two strokes of a pen — one wiggly one and one straight down. Satisfying. You can make the £ likewise with two strokes, one wiggly, one straight. Even more satisfying to execute than the $, though handwriting experts may cavill that the last stroke doesn’t point egotistically straight down the page towards the writer. The € can also be dispensed with in two strokes, and happily the straight stroke (as in the £) leaves your pen heading rightwards, which is convenient for starting the next word or number. The rupee sign? This will take all of four laborious strokes. A curve, a diagonal slice, and two short horizontals. You try assembling all these strokes correctly while writing in a hurry. And nobody writes slowly and painstakingly nowadays. What’s more, while writing, not many people like sharp angles. They are less easy to execute than curves. Which is why the Devanagari “r” usually gains a little loop in the middle where the curve meets the diagonal. That will turn four strokes into three. But now imagine a rupee sign with a loop and two horizontal strokes. Yuck. Do a scribble shortcut, and leave out one of the horizontal strokes. Now you have a traditional Devanagari “r” with one horizontal line. That would look like a vowel sign added to the consonant: “ru”. That is no longer a symbol, it is an abbreviation. The ¥ is boring. It takes at least three strokes, and also fails the handwriting test. Have you seen the rupee sign in print? It’s quickly taking over in the print media. It is not well designed. In headlines it looks remarkably blocky next to the elegant shapes of the professionally designed fonts we use. 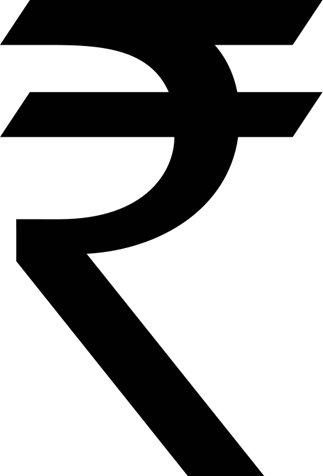 In text it cannot properly be made out because the two horizontal strokes obscure the lovely curve of the Devanagari “r”. What’s worse, when you place it before a number, it looks at first glance like a “2″, especially for one accustomed to reading Hindi numerals. So, what used to be “Rs 5,500″ will now look at first glance like “25,500″. That is a design problem. The $ does not look like a 5. The £ does not look like an L. The € does not look like an E. (It looks like half an egg.) The ¥ is boring. Yes, Devanagari, alongside Roman (English), is the most widely used script in the land. But that does not make it representative of the nation. So why should the Devanagari “r” stand for the Indian rupee? I happen to think the Telugu “ra” is beautiful. The Bengali “r” has promise. The Tamil “r” is intriguing. Why not any of those? Indians not familiar with Telugu, Bengali or Tamil would then be able to see the rupee sign for what it really is: a symbol. If none of the non-Devanagari signs are politically palatable, then how about English? We use it all over. Why not fool around with the well-established R? For that matter, why not dispense with alphabets altogether and invent a pure symbol? The official rupee sign may not be so bad after all. Do please have a look at some of the other designs (here’s a larger image). Terrible! If those were the kinds of options the government had, then thank you very much after all, Udaya Kumar — he designed the chosen sign. In the lane behind the office is usually a long row of illegally parked cars. Most are drably coloured: grey, brown, white. Most days, however, the line is brought alive by a flash of mango — that is, a mango-shaped and mango-coloured Tata Nano. It’s a delight to see it there, seasonally correct on a sweltering day under a green tree. The funny thing is: like some of the larger cars nearby, the Nano too comes equipped with a driver, who sits in the rear seat fanning himself with a newspaper. Now, the car costs under Rs 2 lakh on the road; the driver probably costs Rs 60,000 a year, if not more. It’s amusing, don’t you think, that this car’s owner bought the cheapest car on the Indian road but also hired a chauffeur? It’s like that in the world of the Indian small car. It has become intensely aspirational. Nissan’s new Micra was launched a few days ago, and there you had print, Internet and TV reviewers and commentators telling us about design, inside and out, the “eye-catchingness” of its roundish dashboard instrument panel, and either admiring or scoffing at the car’s peculiar little haunches. Things like seat height adjust and ergonomics and standard airbags were also mentioned, but almost as if such luxuries were only to be expected. Before the Micra we had the VW Polo, and before that the Fiat Punto, the Maruti Ritz, Hyundai’s i10 and i20, the Honda Jazz, the Skoda Fabia… forgive me if I’ve missed a few. All of these new “small” cars, “affordable” hatchbacks, middle-class cars, come equipped with sundry luxuries that all boost the aspirational value of what was once the plain, frills-free 800-Alto-Zen cohort. They may have “climate control”, whatever that is, and extra speakers and split rear seats, and umpteen seat settings and adjustable steering and funny little lights and storage spaces and a rakish bonnet and “aggressive” headlights and a “stance” — whatever that is — yet they cater to something near the bottom of the automobile market. Thus mass-market becomes premium, small becomes big, affordable becomes aspirational. Yes? Okay? Well, fine, if that is the case in the automobile market — and some of these new cars really are clever and desirable — can’t we take this interesting business lesson and apply it elsewhere? For example, in real estate. Here in the metros as far as new residential building is concerned, we have highly expensive and enormous flats and “villas” (more accurately, row houses) in the nearer and more accessible suburbs; large, high-priced builder flats downtown; and, of course, handcrafted farmhouses. None will be available at a price under eight figures. These are the BMWs, Mercs and Bentleys. At the lower end of the market we have medium-expensive and small flats in the further and less desirable suburbs, like Thane outside Mumbai or Ghaziabad outside Delhi. Some of them will have a decent level of finish, but most will not. All will be available at a price within seven figures. These are, with admittedly a few Ritzy exceptions, the 800s-Altos-Zens. What’s in between, for the paying middle classes? Plenty, as far as cars are concerned; very little, as far as real estate goes. One can extrapolate from the shape of the car market that there is a huge, unserved market for mass-market yet premium, small yet big, affordable yet aspirational housing. It’s just silly to say we don’t have space or can’t do it. Every city has underutilised space downtown. The central and state governments selfishly sit on tons of badly used Delhi land. And even a crowded city like Mumbai has hundreds of acres of mill land quickly being released to big builders. What do they build on it? Super-premium offices and eight-figure flats. Silly. They should be building smaller homes to a higher specification for the middle classes. I may be imagining it, but it is the middle classes who spend more money within their own neighbourhood or locality, more than the very well-off. For the health of the local economy, for sufficient numbers and density, for a long-term residential ethos, go after the middle classes — the same notional demographic that happily buys premium small cars. The new, rather smaller, multiple-income Indian family. Try putting up hundreds of wisely designed studio and one- and two-bedroom flats downtown, and watch how much good that does the city. Real estate still has not learnt to compete for the value-conscious Indian customer like the car industry has. In real estate, if you got the land you’ve got the customer by the nose. It’s not like that with cars. The current real estate paradigm of Nearby/Costly and Faraway/Cheap won’t last. A big reward almost certainly awaits the builder who can learn some auto lessons. Where I work I am surrounded by dinosaurs. There is the one who sneezes at the slightest change of weather. The one who eats spicy chips and falls ill; gets well and eats spicy chips again. The one who wears glasses. The one who consumes nothing but samosas and coffee. The one who’s balding. The one who has headaches. The one who has backaches. The one whose cabin is arctic and thundering with overactive AC. The one whose cabin is steamy like Kerala in summer. The one who won’t touch the office tea but swears by the nearby thelawala’s chai. The one who gargles loudly in the loo. The one whose cubicle is piled high with paper. The one who enjoys office meetings. What an imperfect lot. I feel positively run down in such pre-modern company. Oh how I long for the 21st century, when things will be so much nicer. In the 21st century, if there are any offices left at all, they will be full of charming, polite, decorous, stress-free and hardworking people who may work as much as four hours a day — four times a week! In the 21st century, all my fellow workers will be too tough to succumb to germs and viruses, because not only will we eat better, exercise more and use our cars less, our doctors will know how to defeat most pathogens with ease. In the 21st century, if someone sneezes we will look at them with interest, because it will be unusual and amusing. In the 21st century, our vision won’t depend on 16th-century technology like glass lenses. We will be able to grow and replace our own natural lenses, should the need arise. In the 21st century, we will not have smelly samosas and gritty coffee. Both will be banned, and people will have cucumbers and lemon juice instead. In the 21st century, we will never go bald. Our hair follicles will not be allowed to rest. In the 21st century, we will have excellent posture and 20/20 eyesight, so we will never have headaches and backaches. In the 21st century, computers will direct airflow so that nobody is either too cold or too hot. Besides, we won’t have individual cabins, just airy pods that we can move around with. In the 21st century, the only stimulant we will be allowed is oxygen. It may come in various flavours: Sweet Meadow, Bracing Sea, Sharp Mountain, Warm Field, Fresh Bread. In the 21st century, we will not have to go to the loo more than twice a day. And in an emergency the loo equipment will come discreetly to us, disguised as a potted plant. In the 21st century, office meetings will actually be fun, because they will be so infrequent that people will actually be pleased to see each other. And because the work day will be only four hours long, meetings will be short. I sure hope the 21st century arrives soon. Over the past couple of weeks I have spent a fair bit of time peering at Wikimapia, ostensibly because I had to review a book on the Saraswati river. Not the mythical river that meets the Ganga and Yamuna at Allahabad but the real historical one on whose banks the Rg Vedic sages did whatever sages do. According to the book, the Saraswati was the progenitor of the modern Ghaggar-Hakra, an interconnected set of river channels that stretches from the Shivaliks through the Thar desert and down to the Rann of Kachchh. According to the author, who summarises the scientific evidence very nicely, this river, which has a very wide bed but is now nearly always dry, was once fed by the Sutlej and the Yamuna, which did not at that time meet the Indus and Ganga. On the dry banks of the dead river, where now only desert nomads live, are many, many ancient towns and villages, now buried in sand. They, too, point to a time when water was much more abundantly available. So naturally, I took to Wikimapia to check all this out, to look for signs of ancient rivers and traces of buried cities. I found all of that, yes, and it was thrilling — but I also realised that just about every single screenful of satellite imagery was also full of personalised place tags. That’s the way Wikimapia works — it marries Google Earth with Wiki. Google Earth provides the imagery, and ordinary individual users add in the information. So on a satellite image of your part of the world you yourself can identify your office or school or bank or favourite paan or bicycle repair shop. You can outline your own house. Anyone anywhere in the world who zooms in on that area can then see what information you have added in. This being an exercise that only computer users can perform, and that too only when they are on the Net and with a fast enough Net connection to download image data, I found it amazing to see the degree of detail available. For example, in the little town of Bhatner (now Hanumangarh), in Rajasthan, you can snoop on “lilitmohan pareek advocate”, “Mubarak House”, “nitish parek a cool person”, “Lokesh DJ”, “raju mistri” and “Amit Chilana 941——-” (I can’t bear to give his phone number, even if he doesn’t appear to mind). And there’s lots more like this. Outside the town, in the farmland around, you can pay a visit to “Ram singh sandha dhani”, “karan sandha marriage album editor home”, “vashudha ’s house”, “K.I.U. Dinesh”, “Hamuman Mandir”, and so on and so forth. There’s also a “Johal Farm House” sitting — perhaps illegally? — on the damp bed of what may once have been a channel of the Saraswati. Something like this is true of most small towns and their surrounds that I looked at. In Punjab the density is much greater — around Ludhiana the fertile countryside is littered with tags. Now, potential for analysis: clearly a lot of tags are people proudly identifying their homes (”my sweet home”) and land. Indeed, it’s very interesting to see the territorial patterns made by caste surnames — certain localities are dominated by certain names. Other tags are little business ads, with a number, description (”pind di motor”) and address. Some are neighbourhood place markers (”Hissaria chowk”). Others are civil, religious and historical sites: clinics, hospitals, railway stations, mandir, masjids, gurdwaras, forts, museums, havelis, etc. In cities like Delhi, although the density of tags is much greater, they refer more to localities and small businesses or facilities like parks and hospitals — fewer people (relatively speaking) identify themselves and their homes. With time, as information builds up (worldwide, some 10,000 “places” are added to Wikimapia every day; the total is now about 12 million) then this may become a very useful tool for historians, sociologists and anthropologists, not to mention businessmen and corporations. Find out where your competition is or isn’t, where your market is and you aren’t… And it works in the easiest way, with the information being handed to you by hundreds of thousands of local reporters rather than an expensive, imperfect and slow research team. For the moment, Wikimapia is an extraordinarily interesting, amusing and educational way to spend a few hours. Soon it could be a lot more. One morning in Mumbai in February a friend and I leapt into his trusty Hyundai Getz at 5 am to commence a driving tour of southern Maharashtra. The first stage was to be a pelt down the national highway towards Belgaum. The friend being a details fiend, everything was planned down to the minute. Pretty soon this best-laid scheme of us nice men gang seriously aft agley. On the long, long upslope before Khopoli on the Mumbai-Pune expressway, suddenly the engine appeared to stop transmitting power to the wheels. Stamping on the accelerator did nothing but make noise, and then we caught a whiff of something burning. Miserably, we pulled over, got out and threw open the hood. It was still dark, and slightly chilly. We had halted on a turn. Giant container trucks crawled past with their engines screaming against the gradient. Neither of us knew anything about car innards, so my friend got on the phone to find a Hyundai service centre. Nothing in Khopoli, it turned out, nothing closer than Panvel, an hour away in the wrong direction. Towing charges in the thousands, repair charges in yet more thousands, time wasted in waiting. While my friend was still working the phone, scarcely two minutes after we had stopped, a scruffy-looking man on a beat-up scooter trundled to a stop next to us. A mechanic, he said, with a repair shop just down the road, and he would fix what he said was a burnt-out clutch plate for thousands less than the service-centre quotes and in much less time. A quiet fellow, not much of a talker, with a humorous glint in his eye. So that’s what we did. The mechanic left his scooter on the verge, we pushed the car to a gap in the expressway median and then coasted a good way downhill, off the main highway onto the old highway, off that onto a bumpy patch of land and finally into a tiny, lean-to garage. The mechanic had already called one of his colleagues standing by at the parts store, so the parts (original, we checked) soon arrived at high speed on another beat-up scooter. With the mechanic at the shop and a spare colleague, that made four men working on the car. Day broke, a tea shop was the only other structure nearby, and we sipped and chatted relaxedly while the work continued. When it was done, the first mechanic hopped into the car with us, drove us back onto the expressway and up to an ATM. We gave him the cash, he waited for us to leave, then hopped onto the scooter of one of his colleagues who had followed us from the garage to head back, and that was that. We were on our way again, major repair complete, a mere four hours after the breakdown. The point is: in India, the unorganised sector is often more efficient than the organised sector can ever hope to be, and much more responsive to the customer’s needs. The mechanic described their business method. One man circles back and forth on one section of the expressway, while another stands by at the parts stores and a third at the garage. Cars will break down, especially under the strain of a long climb; when they do, help (and profit for the mechanics) is only minutes away. The company service centres lose horribly in this scenario, by being more distant, more expensive, less personal, and less responsive. Had we chosen the service centre in Panvel, we would have lost the day. Instead we got a good, economical repair job and a free lesson in grassroots business thinking. A week or two ago I had the misfortune to be driving home from deepest Gurgaon to Delhi near midnight, through a thick fog, on the national highway. This national highway, unlike most other NHs in India, is a Herculean carpet of Tarmac and concrete laid across the landscape. Riding it at speed is like surfing the spine of a dinosaur, as one rise and falls on the flyovers and flat stretches. The other day in the narrow lane behind our office I waited to pass as a vast ivory-white SUV executed a three-point (well, many-point) turn to head back the way it had come. Any other car thus hemmed in would have looked silly — and so, despite its de luxe pedigree, did this Audi Q7. What was such a fancy automobile doing lurching about in this dingy lane? Needless to say, a chauffeur was doing the driving. The owner, no doubt some sort of businessman, must have been paying court at the sales tax office nearby. In India there’s no escaping the close juxtaposition of stylish and sordid. But surely they don’t have to be forcibly united — by, no less, a German luxury brand? I’m talking about the ads taken out by the Audi Delhi and Gurgaon dealerships in the Sunday, December 6, “HT City” and “Delhi Times”. On page 3 of City, Audi Delhi had a mid-size ad promoting the A6, Audi’s mid-range sedan. And on page 2 of DT, Audi Gurgaon bought a full-page ad to showcase its big new showroom. A test drive in the new Audi A6. Your good karma of the day. One good turn deserves another. Hence the new generation of the Audi A6 that continues to enjoy an undoubted worldwide leadership in its class. Set foot inside; you’ll know you’re doing the right thing. The new Audi A6. It’s perfection reincarnate. Now this is poor advertising copy. What good turn did I do? Or am I doing good (”the right thing”) by test-driving the car? Is the car itself the reward for someone’s good turn somewhere? Why mention doubts at all? As for the last two phrases, yes, okay, I get it, it’s an updated model — but now we’re talking reincarnation? With 14 models on display, you will discover the widest range of options than anywhere else. The models, variants and accessories on display are among the newest and most advanced offerings. Adding another feather in the cap, Audi Gurgaon has opened a luxury car workshop, the largest in the country with world class facilities and state-of-the-art technology. Be our guest and discover the world of Audi with a team as passionate as the experience of the automobile. How unappetising. That’s not even English. And the photo of the workshop makes it look like a garage with glass walls. Not much style there. Shouldn’t that be the Audi experience? And please, save the SMSing for bad TV talent shows. Unless — and this is chilling, though perhaps obvious in retrospect — the only people who can afford an Audi are the ones who didn’t need to invest in the polish of an all-round education. That’s another sad sign of the times: money and class have very little to do with each other. Whatever the truth, a European luxury brand ought to have a little more self-respect.